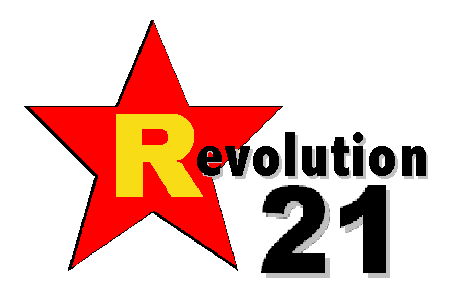 Revolution 21's Blog for the People: Jolly good show, Rupe! As we used to say in junior high school . . . DUHHHHHHRRRRRR! Imagine . . . Rupert Murdoch locked up The Times website in a virtual Tower of London. His competitors didn't. And, after he no doubt did all kinds of research to justify what he was hellbent upon doing anyway -- and after no doubt spending loads of money putting up the paywall -- what happened was what I could have told him would happen in exchange for a MacBook and a bottle of good bourbon. As the fugitive businessman Asil Nadir flew back to Britain from his North Cyprus bolt-hole last week, Sean O'Neill, the crime editor of The Times, scooped Fleet Street by being the only print journalist on the plane. Yet those searching Google for the latest on the breaking story that morning would have found no sign of O'Neill's exclusive – only follow-up stories by rival news organisations such as The Guardian and ITN. 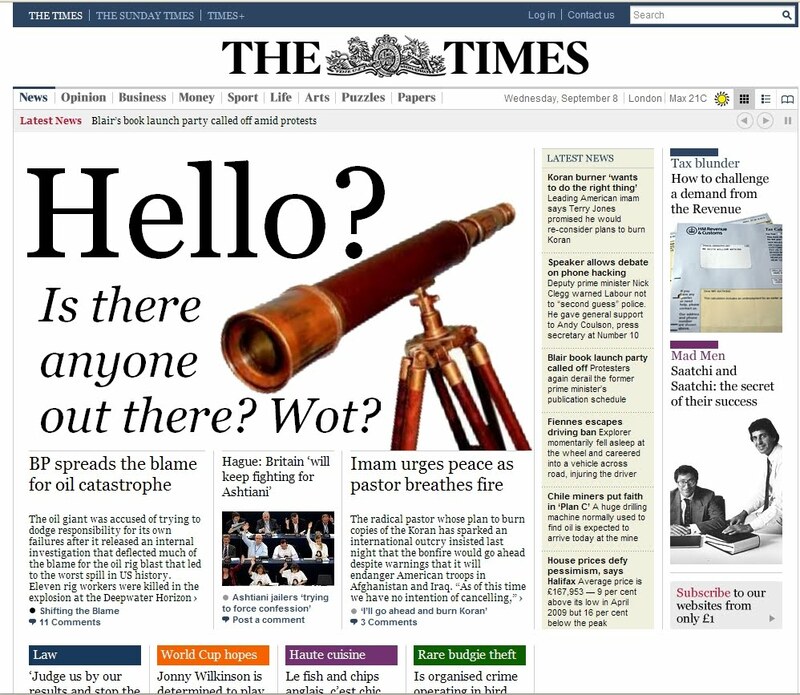 Faced with a collapse in traffic to thetimes.co.uk, some advertisers have simply abandoned the site. Rob Lynam, head of press trading at the media agency MEC, whose clients include Lloyds Banking Group, Orange, Morrisons and Chanel, says, "We are just not advertising on it. If there's no traffic on there, there's no point in advertising on there." Lynam says he has been told by News International insiders that traffic to The Times site has fallen by 90 per cent since the introduction of charges. "That was the same forecast they were giving us prior to registration and the paywall going up, so whether it's a reflection on reality or not, I don't know." He warns that newspaper organisations have less muscle in internet advertising campaigns than they do in print. "Online, we have far more options than just newspaper websites – it's not a huge loss to anyone really. 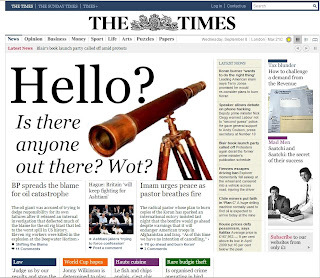 If we are considering using some newspaper websites, The Times is just not in consideration." THE TROUBLE with newspaper dinosaurs today is that advertisers aren't nearly as stupid as they are. DUHHHHHHRRRRRR, indeed. P.S. : Thinking on this a little more, I believe there's only one way you'll make paid online "newspaper" content work. It needs to be iPad friendly; it needs to be a rich, flashy multimedia experience . . . and once you've bought it, you need to be able to keep it on your hard drive, or whatever. Just like you can keep a dead-tree edition of the paper. As they say -- or at least used to say -- in the housing market: Why rent when you can own? Labels: Britain, capitalism, dumb, Internet, journalism, media, newspaper, paywall, press, U.K.